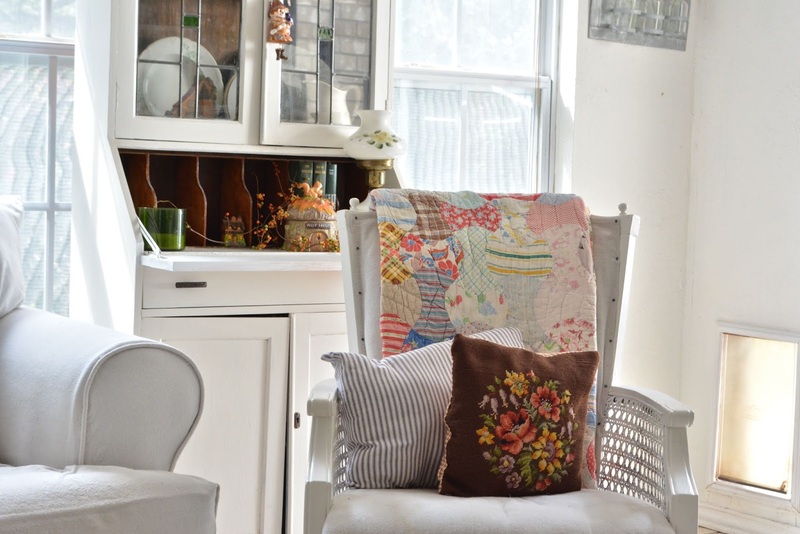 Our sunroom is one of our favorite spots in the house. I thought I'd show it to you first instead of saving the best for last. Swing open our French doors and this adorable space is in view. 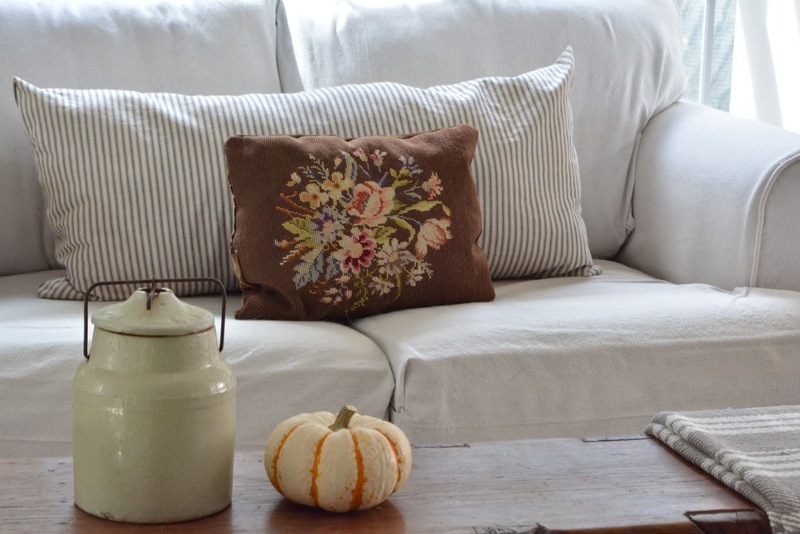 My favorite fall needlepoint pillows adorn the loveseat and chair. The wooden bench got pulled down from upstairs. 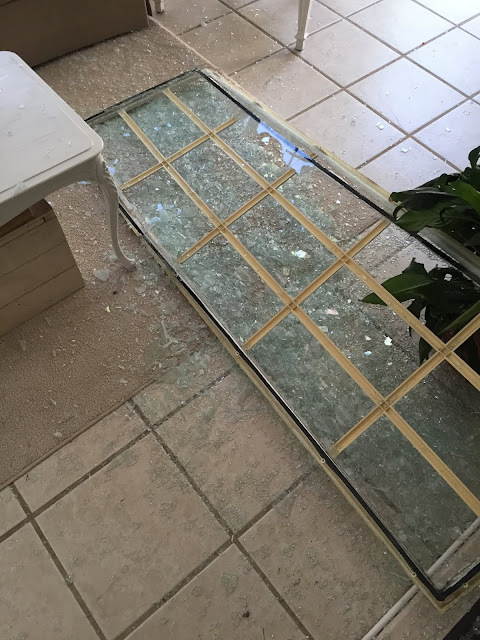 It was in our hallway. I love it in here. 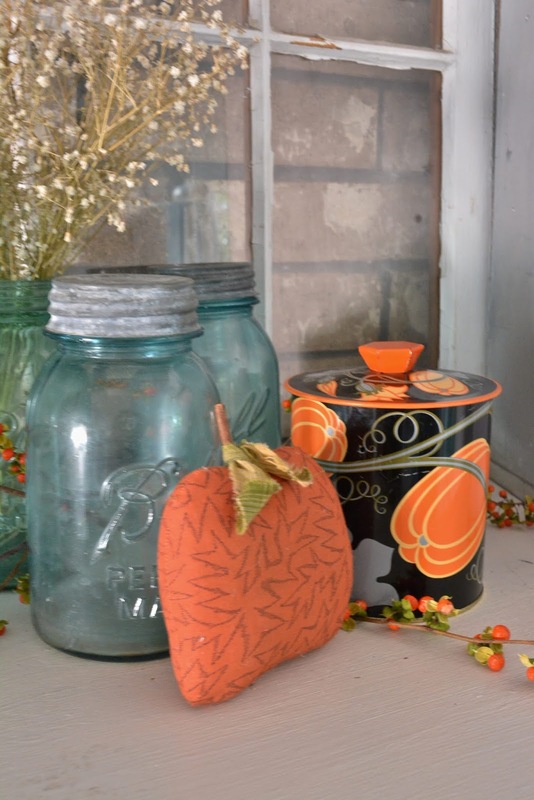 The crock and the pumpkin are simple but festive autumn touches. The pillows were antique or thrift store finds a long time ago. An old and dear friend from my teaching job doesn't have children so she will pass things to me as she cleans out. She brought this quilt to me in a paper sack when I was subbing last spring. Can you even? It's so gorgeous. 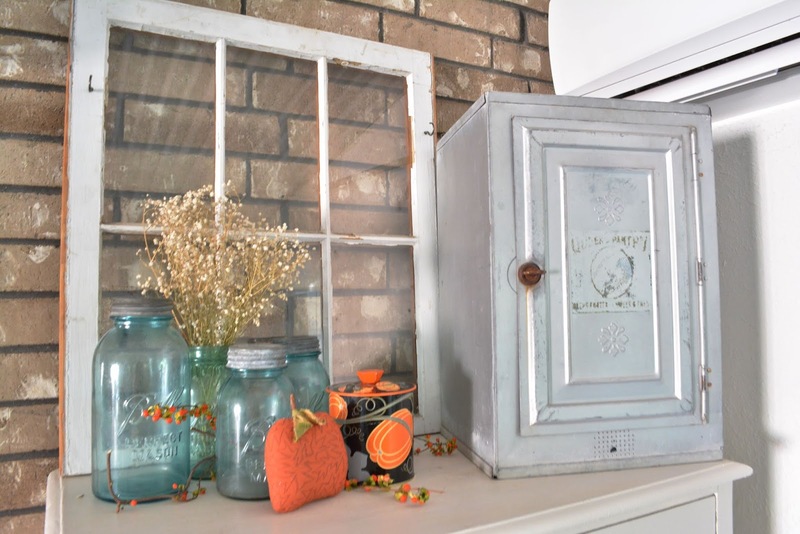 The nut jar violated my rule about only buying vintage items that are in perfect shape. The squirrels little tail has been repaired but it was too cute to pass up. 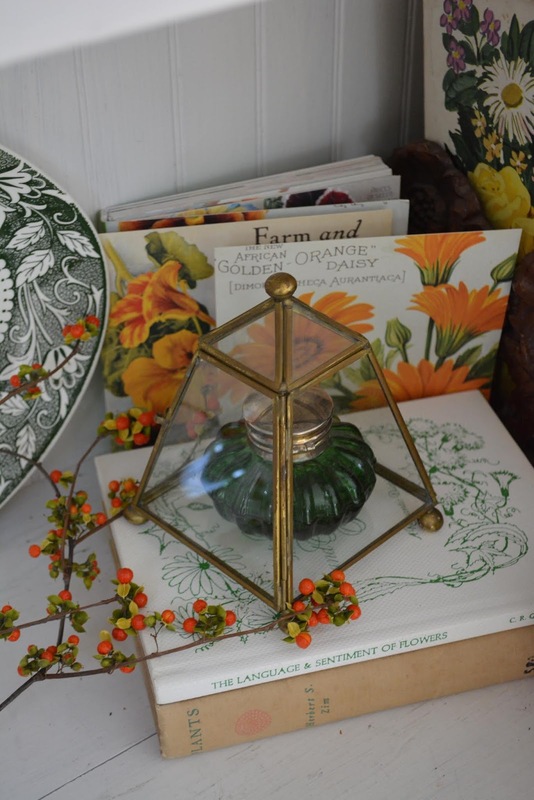 The ceramic cottage lidded trinket box reminds me of our trip to the Cotswolds this past summer. Bill got a new chair a while ago. It's the STRANDMON wing chair from IKEA but you may have figured that out since IKEA CAPITALIZES EVERYTHING. I encouraged him to get a wing chair for comfortable napping on Saturdays. That way he has something to rest his head on when he falls asleep. I personally don't find it a comfortable chair so I never sit in it. Across from his chair is our pie safe and our Mitsubishi Mini Split Air Conditioner and Heater. It has turned this room into a four season room. It is amazing. The black lantern on the brick wall is still here from when this space was our old back porch. I got the lantern at a garage sale for just a few dollars 25 years ago. It was probably one of the first light fixtures we replaced after we bought the house. Bill wondered why we were replacing things on an almost brand new house. In hind sight, I should have said, "Get used to it." 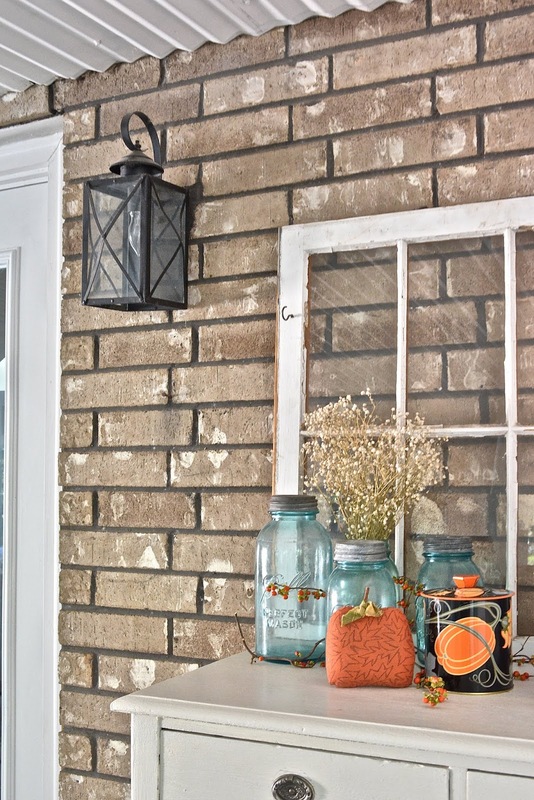 Mason jars look so good with pumpkins. I got my pumpkin canister on a thrifting trip with my brother. 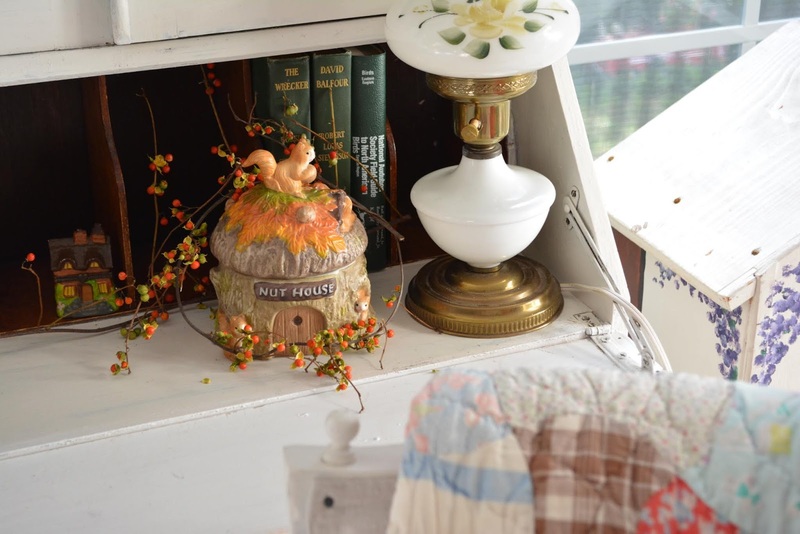 Finally, the darling dish dresser on the other side of the room is sprinkled with fall whimsy. 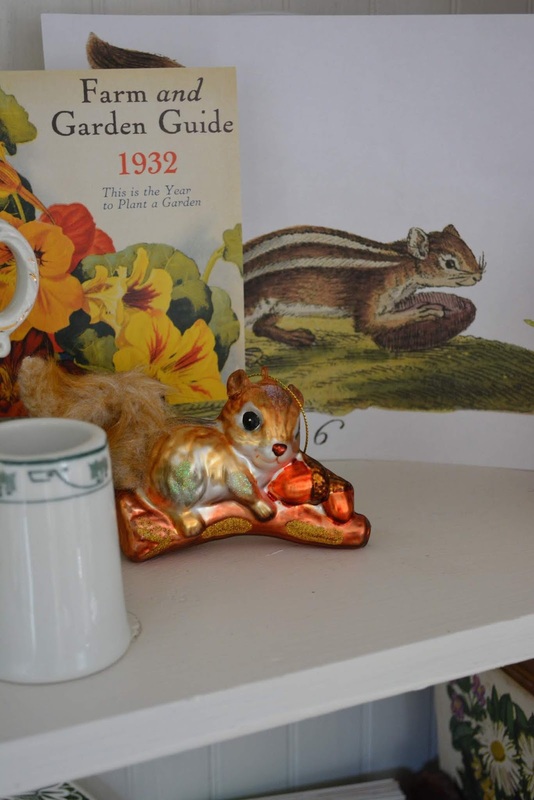 The glass chipmunk ornament was found at Hobby Lobby in Christmas section. I found the vintage chipmunk graphic on the internet a few years ago. 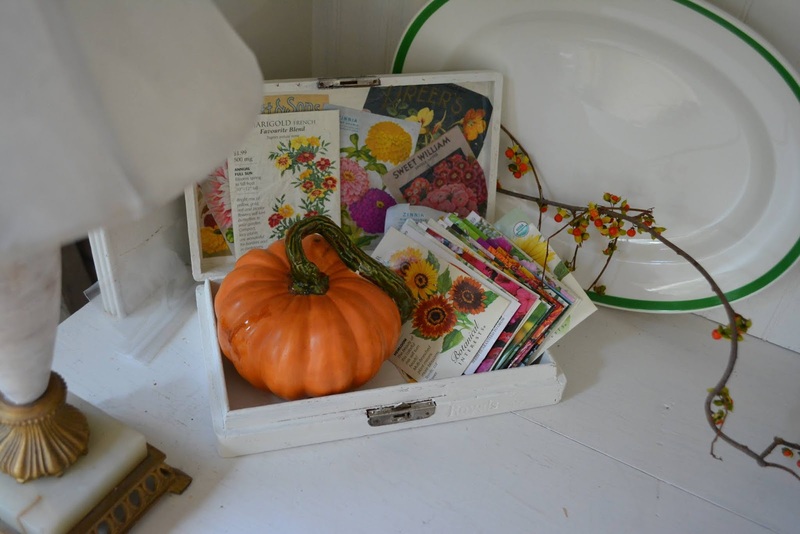 The seed box got fall flower packets. 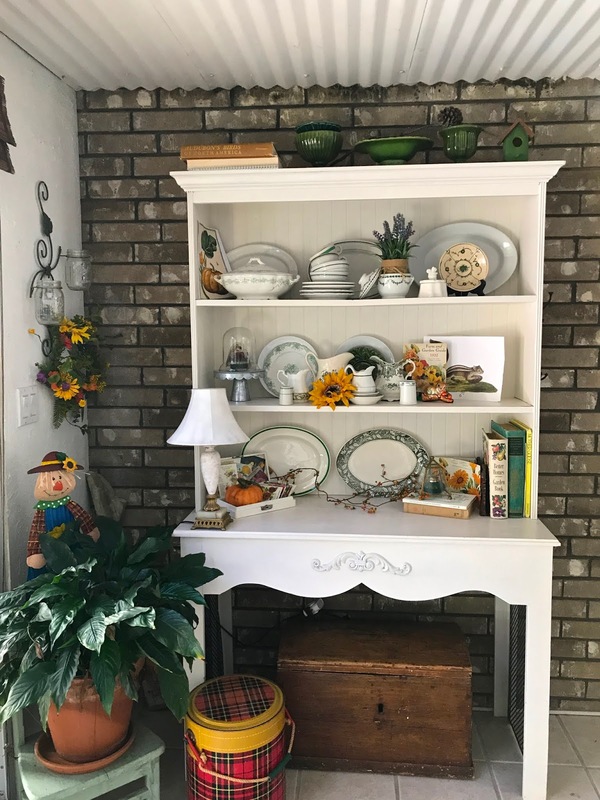 My favorite ceramic pumpkins rests next to them and bittersweet rambles in front of the platter. Read about the scarecrow transformation in this post. 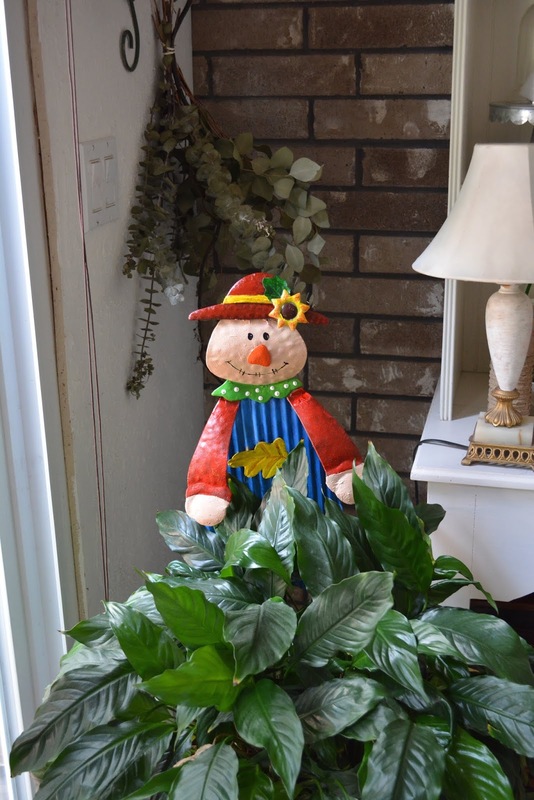 This room may look the best during the fall but it's also fun at Christmas and in the spring. I linked this to Share Your Cup. 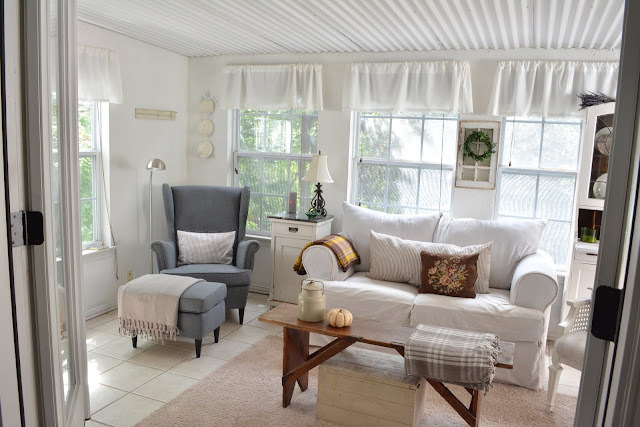 Love your pretty neutral sunroom. Swooning over your pictures. I love your pretty white room. It is the perfect canvas to decorate for the seasons. Your Fall décor is both festive and cute! Katie, our sunroom is our favorite too. We use it year round like you. Thanks for sharing yours. 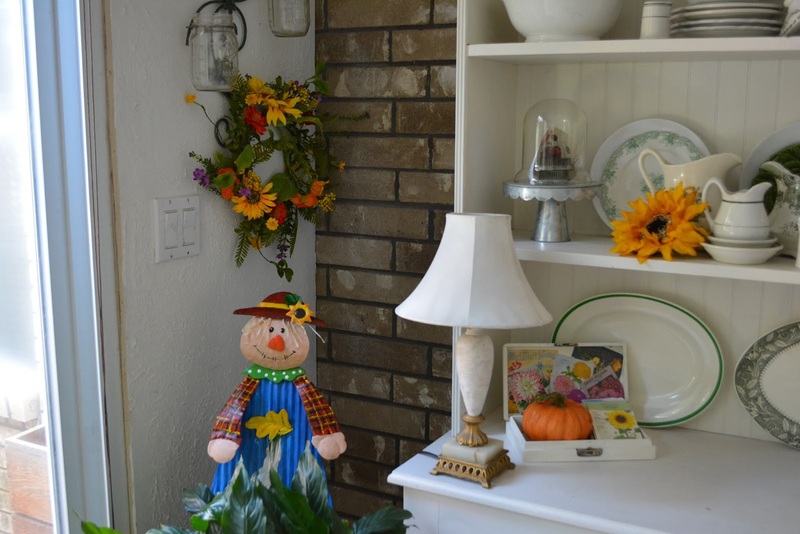 It's fun to see how others add special fall touches. Cute little chipmunk! Oh what a delightful room and so perfect for enjoying fall! 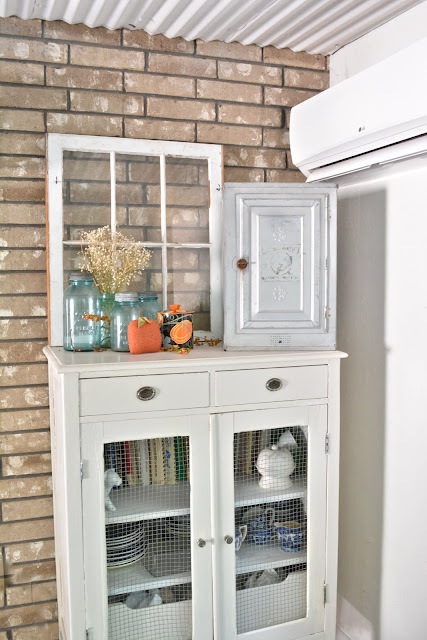 I would love for you to come over and share at Thursday Favorite Things! The party is live now through Saturday at midnight. Hope you can join us! 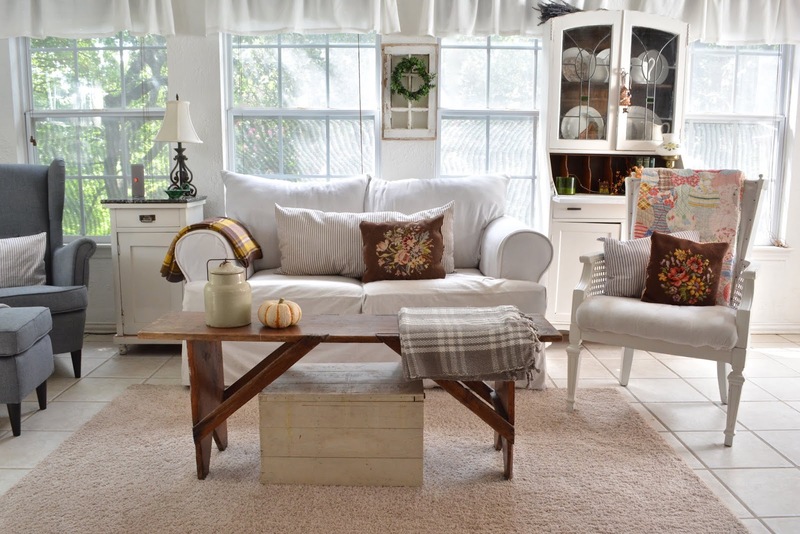 Good morning Katie, I love this room and the way you mix all the plaids, stripes and prints together. That takes talent and you do it with such charm. I love all the light in that room, too. Very pretty. 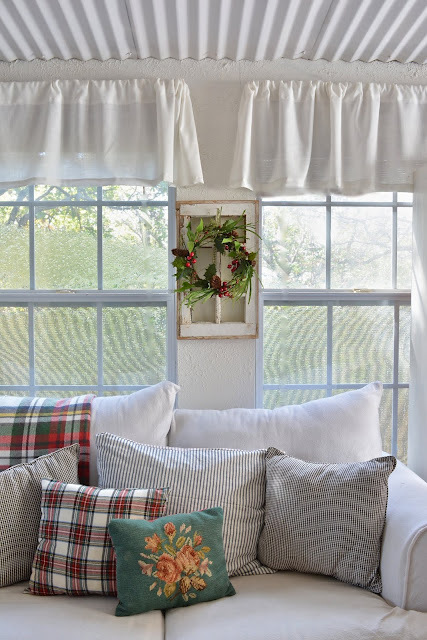 Gorgeous decoration.The pillows are treasured!Hugs! It's a very pretty and comfortable looking room Katie! I love your sweet squirrels and that quilt is amazing! Thanks for sharing with SYC.